The U.K. Foreign Office said that on February 24 and 26 hundreds of headstones in two British military cemeteries in Benghazi were vandalized. Markers identifying Christian or Jewish war dead were damaged or broken. 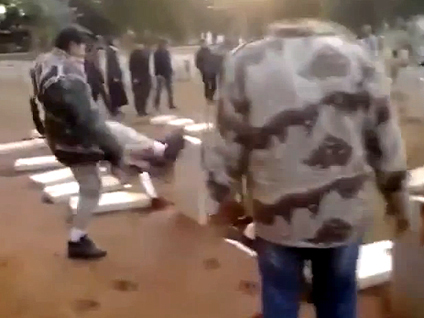 In video re-posted on YouTube the men (including the videographer) are seen kicking over or smashing headstones. One man takes a hammer to a ceremonial Cross of Remembrance. Men are heard saying of the dead, "They are dogs." The BBC reports that a group of older people intervened during the attack on the British Military Cemetery, preventing further desecration. According to BBC News, the suspects in the attacks are militant Islamists known as Salafists, as they also targeted Muslim shrines. Alistair Burt of the U.K. Foreign Office told BBC News, "It's horrific and wrong and we have expressed to the Libyan authorities our profound distress at what has happened on behalf of those who have loved ones there." Libya's ruling National Transitional Council has apologized for the vandalism, calling the acts "unethical, irresponsible and criminal," and promised to find those involved. The Australian reports today that arrests have been made of a group of young people believed responsible for the attack. The U.K. Foreign Office said that more than 200 headstones were vandalized in the Commonwealth War Graves Commission Cemetery in Benghazi, where more than 1,200 British Commonwealth servicemen killed in Western African Desert campaigns in World War II are buried or commemorated. About a quarter of the headstones in the Benghazi British Military Cemetery - which contains more than 300 burials, most from non-World War service - was also vandalized. The Commonwealth War Graves Commission said both cemeteries will be restored "to a standard befitting the sacrifice of those commemorated at Benghazi," but that the replacement of stones would take some time; in the meantime temporary markers will be erected over the graves. To watch a YouTube video of the vandalism click on the player below.